As a co-op research and design engineer at Facet Technologies for 3 semesters full time, and 2 semesters part time, I worked with teams of other mechanical engineers and industrial designers to develop blood sampling devices commonly used for diabetes or low volume blood tests. Two products for which I contributed to the design, testing, quality validation, and manufacturing are shown below. Both these products are currently marketed. I also worked on constant blood sugar monitoring project that has not yet been completed. The grey product to the left is part of the Freestyle Flash blood glucose meter kit. It was designed to be the least painful diabetes testing device on the market, and it works so well that the user doesn’t usually feel the prick. 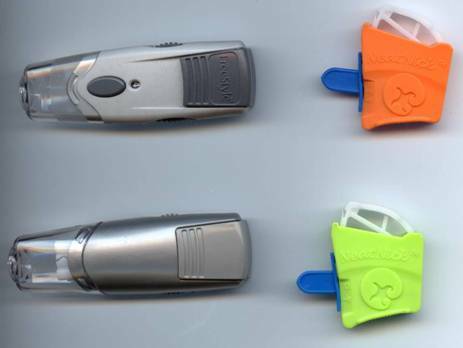 The orange and yellow products on the right are NeatNick Sweeping Action Heel Lancet produced for Hawaii Medical. These are designed to make a minor incision into a newborn babies heel to take blood samples. This device is an improvement over similar products, due to the high precision incision which does not wake babies or make them cry. Designed, and constructed a custom assembly line machine to streamline the assembly of a product. The machine was built almost entirely on my own, salvaging most of the raw materials from out of commission machinery. I designed the electronic system which controls the assembly line, and provides safety measures. The machine performs the final steps of assembling the product, then counts and bags them. It also had to conform to OSHA standards. The Director of Product Development Engineering and others at Facet Technologies were impressed by the functionality of the machine, and the creativity and workmanship that went into the construction.